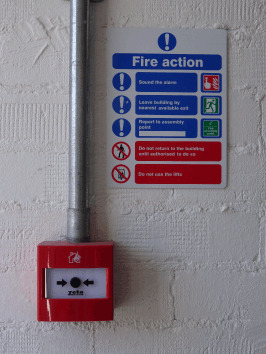 Ourfire door signs access and emergency safety signs form part of our fire safety signs range. These signs are mandatory fire action signs, with white pictogram in blue circle and supplementary text of white text on blue panel. All the prohibition signs are produced to UK, EU and international standards ISO EN 7010, BS 5499, Fire Safety Regulations Reform (Fire Safety) Order 2005, The Fire (Scotland) Act 2005 and the Safety Signs and Signals Regulations 1996. Categories of signs cover fire and emergency doors, housekeeping safety and action notices in the event of an outbreak of fire. This area to be kept clear at all times symbol and text safety sign. Fire door Keep shut, mini safety sign. Fire door Keep locked, mini safety sign. Close this door at night, mini safety sign. No admittance authorised personnel only, fire door keep shut sign. Fire door Keep clear sign. Push to open, Fire door keep shut sign. Pull to open, Fire door keep shut sign. Fire door keep shut photoluminescent sign. Fire exit keep clear photoluminescent sign. Fire door keep clear photoluminescent sign. Keep locked shut photoluminescent sign. Fire exit, running man right, fire door keep shut fingerplate photoluminescent sign. Fire exit, running man left, fire door keep shut fingerplate photoluminescent sign. Push door to open / fire door keep shut fingerplate photoluminescent sign. Pull door to open / fire door keep shut fingerplate photoluminescent sign. Fire door keep shut safety sign. Fire door keep locked shut safety sign. Automatic fire door keep clear safety sign. Fire exit keep clear safety sign. Keep out symbol and text safety sign. Keep gangway clear symbol and text safety sign. Sound horn symbol safety sign. Pedestrian route symbol safety sign. Pedestrian route symbol and text safety sign. Keep clear symbol and text safety sign. Keep away symbol and text safety sign. Keep off symbol and text safety sign. Passes must be shown symbol and text safety sign. In the event of a fire sound alarm symbol and text safety sign. Keep locked shut symbol and text safety sign. Please keep shut symbol and text safety sign. Fire door keep shut symbol and text safety sign. Remember to close all doors symbol and text safety sign.